When helping my students fall in love with books became a priority, everything changed. My relationships with students. Their relationships with books. The look and feel of my classroom. As I turned to experts like Nancie Atwell and Donalyn Miller, I realized that having the books I wanted to share with my students RIGHT UNDER THEIR NOSES was critical. The more wonderful books I could have in my room, the more wonderful displays I could create with them. The more ways to draw my students into their pages I could come up with, the more my students would thrive as readers and English students. I'm not going to lie. Committing to sharing my love of reading with my students was not always easy. I'll never forget the day I faced off with my department chair in the computer lab, arguing with him about the best reads for my tenth graders, most of whom were English Language Learners. The canonical choices I had been given, like The Canterbury Tales and Dante's Inferno, were turning them off and making them hate books. I wanted to try them on some YA, some dystopia, some books that they would look forward to reading. The rest of my team thought I was insane. "The more they read, the better their English becomes. The better readers they are. The better writers. The more they enjoy school. " I tried everything in the book to convince him what a difference reading books they loved would make to my students. He wasn't having it. After lots of back and forth, he came to his final argument. "Where's your evidence?" he asked. I just couldn't seem to get through to him. So frustrated I began to cry, I realized I was just going to have to do it my own way. I would weave independent reading into my students' lives right alongside the curriculum. There was no need to choose. We would read for pleasure and we would read the canon. And the more we read for pleasure, the more, I believed, they would begin to enjoy the canon. I worked with my school librarian to bring in books to fill my shelves. I scoured Goodwill for great titles. I stopped into library book sales and rummage sales. I sorted through my own boxes of boxes in storage. I made posters and bookmarks, displayed students' book projects and literary-themed postcards around my books. My reading library became the heart of my classroom. This post features some of my favorite book display and reading library ideas from Instagram, in hopes that you will find a new way to pull kids toward your own reading library or be inspired to start one of your own. If you are just getting started on this journey, you might want to check out podcast episode three, "Starting a Free Choice Reading Program," the post "Help Students Fall in Love with Reading," and one more post featuring books students love called "Jump Start your Class Library." 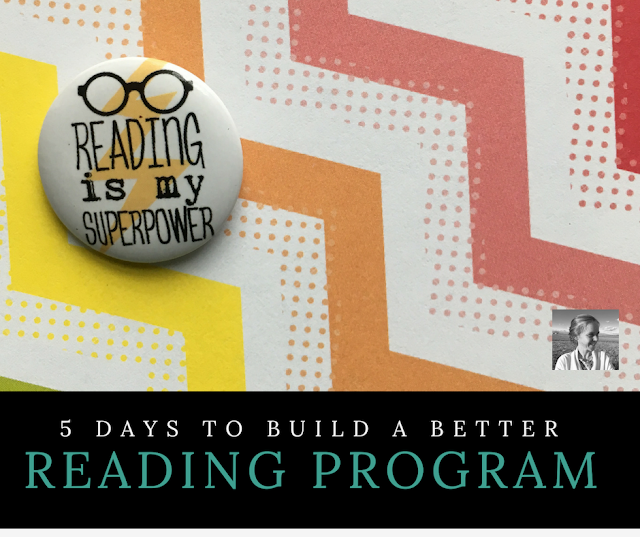 By the way, if you'd like a little help developing your program into one of the most fulfilling parts of your work with students, check out the free e-course, 5 Days to Build a Better Reading Program. You'll get five days worth of easy, actionable steps with helpful links and free resources, all delivered straight to your inbox. Just sign up below to get started. Now, let's jump in for a tour of beautiful reading spaces and displays on Instagram. If we haven't connected over there yet, you can find me @nowsparkcreativity. Can't wait to see you there! I love the rainbow bookshelf idea. I have my cookbooks arranged this way at home, and one of my friends did it with a giant bookcase. This could make a fun surprise during the gray month of February or to open the school year before things get pushed around. Whoever first thought of the speech and thought bubbles for books really nailed it. If you've got some shining stars hiding in your bookshelf, pull them out and give them a voice of their own. Wrap your books in covers featuring the first line and see what intrigues your students. It's a powerful writing lesson at the same time as it delivers dramatic hook value for readers. Your top ten display could be the most popular reads in the classroom right now, the most popular books recommended by the outgoing class from the year before, the top most popular books in a certain genre, etc. But one thing is sure, that number one book is suddenly going to seem pretty irresistible. I like this fun riff on the DVD rental boxes you see outside grocery stores these days. Catch students attention with a "Readbox" (free) rental stand of your own. Ha ha ha. What coffee-loving student could resist "Starbooks?" What a brilliant idea from Pamela Smith. 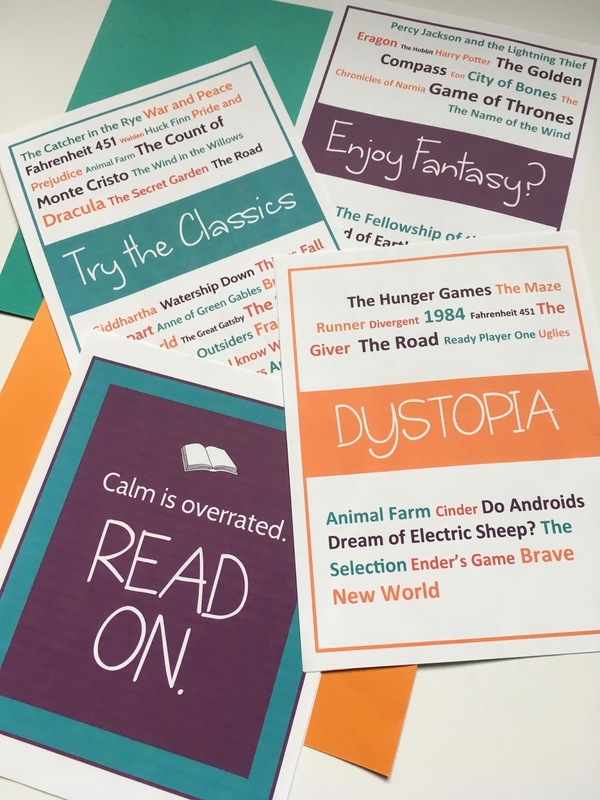 Whether you decide to showcase book covers by class or just put everyone's up together, I love this idea of visually presenting back to students what they are reading. Watch their interest grow as the bulletin board fills up throughout the year! Banned books week is a great time for a fresh book display. Something about the teenage psyche is always going to be drawn towards books adults have decided, at some point, should not be read. Show them the power inside the pages by featuring some of your favorite previously banned books. While I like the shiny positive style of this classroom library, my favorite thing about it is its VOLUME. Wow! Someone has been doing some serious curating, and their students are sure going to benefit. The flexible seating craze has spread far and wide, and personally I think it has outside reading library written all over it. If there's any possible way for you to drag an old couch into your classroom, pick up some poofs at Ikea, or throw giant pillows into a corner, the time is now! 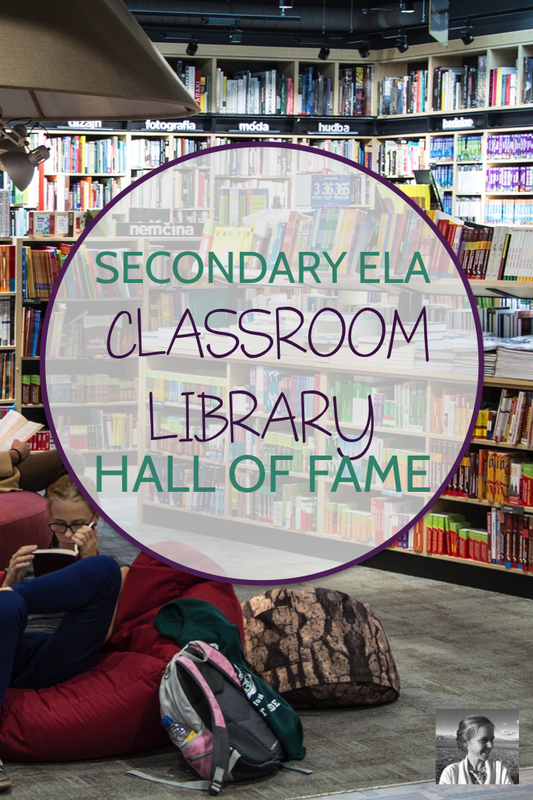 This teacher features her book Hall of Fame straight across the top of her library. No student browsing for books will have a chance to miss THE MOST POPULAR titles. And frankly, isn't that where we are going to hook most of our readers at first? So cozy! What a friendly and inviting space. We focus so much on creating this type of space for our younger students, but really, does anything happen to them as they get older that suddenly they don't enjoy beauty and comfort? I like the label concept here. Dividing books into the realms of graphic novel, classics, dystopia, science fiction, etc. can help those focused on their favorite genres far more than alphabetical order. I notice many children's libraries have bins devoted entirely to favorite authors or favorite themes (superhero books, etc.) to help kids easily select their favorites. Grouping in different fun ways could do the same for our older students. You could feature popular authors, styles of writing, and themes as well as genres. Maybe even change it up throughout the year. So fun! So true! This display is simple but powerful. While it may not suit everyone, I think the color theming here is really nice, and I love the concept of putting up a giant poster or piece of contact paper that makes it seem like your cozy reading corner is next to a plate glass window looking over some stunning natural scene. Scholastic reposted this from @thesuperhero teacher, who is always a great go-to for classroom visuals. Well, that's a wrap on our tour through Insta! Hope you're feeling inspired to add a new element or display to your library this year. If you're looking for an easy way to draw your students' eyes to your reading library, sign up for this colorful and bright set of eight reading library posters I designed for you! Subscribe below and they'll be on their way. Excited to chat about your fabulous plans for your reading library? Jump into my Facebook group and tell our community of 1000+ creative English teachers all about them! Happy New Year!! I love the Hanson Hallway design...that's so cool! I used to have a reading nook in my classroom, but I had to change classrooms 😢, and now I barely have enough room for us all to fit! In my 2nd hour, there are 42 kids and my 6th has 44 (with the other hours averaging a "small" 24-35...my 3rd hour is my only 9th grade English class, and with 24, it is heavenly!). For about 10 weeks at the beginning of the school year, 10-15 students in the "big hours" had to sit on the floor (yup...all behind my desk, like we were huddled at a bonfire! Hehee!). I got creative and bought some large bean bags and a couple squishy chairs so they could be comfortable (which they argued daily about who would sit where), and then one day I arrived at school to find 5 additional tables sitting in the doorway by a stack of chairs. I'm assuming they were sitting in the doorway because after looking at my room, the people who dropped them off had NO clue how to fit them into our tiny room. Well, we did, and it's not pretty! After MANY attempts at organizing and re-organizing, we were able to fit everyone in the room at a table with a chair. Needless to say, the bean bags and squishy chairs are now in a storage closet up the hall. I miss my old, very spacious room, that we often referred to as the penthouse 😀. Right now, our classroom library is stored away in boxes at my house because we dont have anywhere to put them in our classroom. I thought about finiding a tall filing cabinet to put in one of the corners of the room and fill it with a library of books, making each drawer a different genre (because they actually would hold quite a few books! ), but I'm still on the hunt bc those things are expensive! Whew! When I do, your posters will be an AWESOME way to guide them in the right direction. Thank you so much!! I love them! In the meantime, I still obsess over buying books on Amazon when they go on sale. I secretly listened to and took notes all 1st semester regarding the likes/dislikes of every 9th grader in my 3rd hour. Little by little, I purchased them all a brand new book in their preferred genre and format (print/audio/ebook) that I knew they would love and gave it to them before leaving on winter break. Some of them have never had a brand NEW book of their own, so to see their excitement about their own book (as well as their curiosity about what books others in the class received) seriously made me almost cry! It's a rare occasion for me to see 9th graders so excited about books and reading! It was important to me to find books that were relevant today, with characters they could understand and make connections to their own lives. A few of the books I bought were The Hate U Give, Long Way Down, Tears of a Tiger, Ghost, Dear Martin, How it Went Down...and so on. I told them they could read them over break or wait until we return, but they have to bring them to class in 2018 because I'm planning an awesome unit called "YA Lit and the Authors that Rock Our World!" It won't be awhile until we are able to start using your blogging resource that I purchased on TPT, but it is all part of my big plan! I'm super excited and I think they are going to learn soooo much! I'll be sure to keep you posted on our progress! Thank you again!